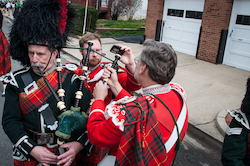 he City of Alexandria Pipes and Drums is a EUSPBA-Sanctioned Grade 4 pipe band based in Alexandria, Virginia. We play a prominent role in parades, festivals and special events throughout the greater Washington, D.C. area. Combining precision marching with innovative musical arrangements, the band has been delighting audiences for over four decades. 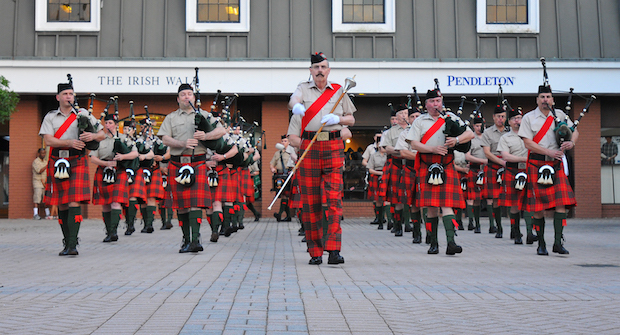 Patterned after a traditional British military pipe band with over 20 active pipers and 10 drummers, the band is under the musical direction and leadership of Pipe Major John G. Sprague and Drum Major Kevin Donnelly. The band has also performed at the White House, foreign embassies, a gubernatorial inauguration, the President's Cup golf tournament, rock concerts, university commencement exercises, military ceremonial balls, and many other prestigious events. 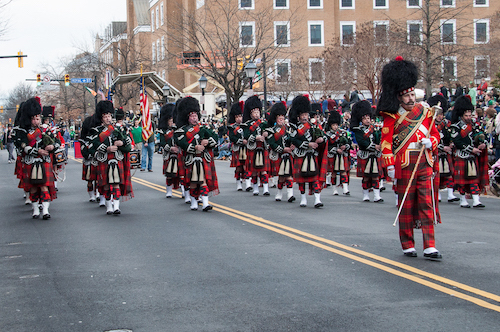 We maintain a year-long schedule of parades, local concert appearances and competitions at highland games. CAPD has consistently placed among the top bands within its grade in EUSPBA’s Mid-Atlantic Region. One of the Mid-Atlantic's premier pipe bands, CAPD has for many years attracted musicians of varied ages and backgrounds. Our Current Band Roster page contains profile information on our members and recruits. Our Band Alumni page contains profiles of former members who contributed to the band's success. A hallmark of the City of Alexandria Pipes and Drums is a high standard of dress and drill discipline. Slow and quick march drills are distinctive features of the band's performances, and they are an integral part of practice sessions. The Pipers wear green tunics and the drummers wear red in their Full Dress uniform, to highlight the historical tradition of pipers being privately employed while drummers were enlisted military. The drummers also play bugles which is unique among civilian United States pipe bands, but has historical ties to the British Royal Marines. Uniforms and certain instruments (drums, bugles) are provided to members at no charge, with the understanding that loaned band property must be properly cared for and maintained. We welcome recruits at all levels of experience. Admission as a playing member depends on practice attendance and skills evaluation by the band's instructors. Rehearsal is held each Thursday from 7 till 10PM at the Durant Center, located at 1605 Cameron Street in Alexandria Virginia. Observers and prospective recruits are invited to attend with the permission of the pipe major. CAPD is a tax-exempt charitable organization under Section 501(c)(3) of the IRS code.